The Indian sports broadcasting landscape has evolved significantly over the last quarter of a century and has grown into one of the largest sports broadcasting markets in the world. This will not come as a surprise considering the proliferation of television, mobile and internet technology among the Indian population. According to estimates, more than 780 million1 Indians have access to a television in India and more than 183 million2 households own or have a television set. Further, estimates suggest that India recently passed the 500 million internet users mark3. India possesses a constantly burgeoning viewership base that is hungry for content (and sports content in particular). Live broadcasts of sports events now regularly appear on the annual lists of most watched events on television and other broadcast platforms with cricket matches being near the top of the charts. A 2017 report by the Broadcast Audience Research Council (BARC) of India revealed that for the year 2017, the ICC Champions Trophy 2017 final between India and Pakistan was the most watched single day event in the year4, whereas the 2017 season of the Indian Premier League (IPL) commanded the highest share of Indian television viewership across all genres in the calendar year.5 The story on digital is similar. The online broadcast for the 2018 IPL final on Hotstar across mobile and internet platforms reportedly set a global record for the must number of simultaneous online viewers for a single event.6 As a result of the high viewership potential, the value of the rights fees being paid by sports broadcasters for media and broadcast rights to marquee sports events in India has escalated dramatically and is comparable to, and in some cases higher than, rights fees paid for similar sports events around the world. With the explosion in the value of rights fees, the Indian broadcasting market has transformed from a service providing industry, as was the case up to the early 1990s, to a content acquiring and dissemination industry. 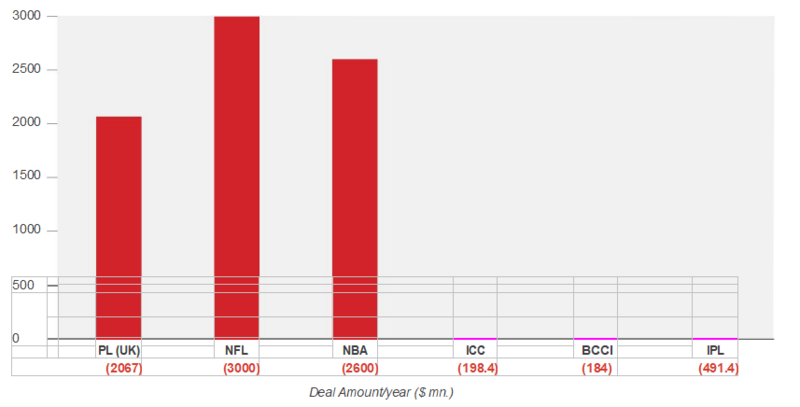 Where Indian sports authorities were at one time compelled to hire sports broadcasters of their own volition and out of their own pocket to provide live or recorded coverage of sports events, broadcasters now compete with each other in auctions, and pay sports authorities, leagues and federations record amounts of fees to secure exclusive media and broadcast media rights for their events. Media and broadcast rights now serve as the foundations upon which the commercial framework of professional sports is built and sustains itself. Federations, event organisers and governing bodies are able to utilise the revenues received from the sale of broadcast rights to invest back in the sport, remunerate players and coaching/training staff, maintain, build and upgrade facilities and distribute revenue to teams that participate in events. Under the current landscape, the broadcast rights holder effectively acts as the underwriter of the event for which it holds rights. Further, the broadcast and dissemination of event content across multiple platforms enables the on-ground sponsorship structure of the event to have value through wider exposure, and thus event organisers are provided a fillip in their negotiations with potential event sponsors. With respect to professional sports leagues in India in particular, a share of broadcast rights revenue is generally the largest revenue stream for a participating team and is the primary incentive used by league organisers and owners to encourage prospective owners to buy or invest in teams. In some cases, the broadcaster has played a key role in promoting and setting up the league itself, such as with the Indian Super League (ISL),7 or has acquired a stake in the league, as is the case with the Pro Kabaddi League (PKL)8. With respect to players and athletes, media and broadcast rights are the primary sources of revenue for sports bodies, which eventually trickle down to players/athletes as salaries, fees and prize money. Sports broadcasting builds brand value of athletes through exposure on air, enables exposure and mileage for athletes’ sponsors. The income earning potential and increased exposure motivates more and more people to take up sports and creates a wider talent pool across sports. For fans, the media and broadcast rights ecosystem incentivises broadcasters to bid for events and ensure coverage of a sports event and enables them to connect with the athletes they support or admire. The evolution of the Indian sports broadcasting market to the behemoth it is today, can be traced back to the early 1990s and coincides, as one would expect, with the gradual emergence of India as the now undisputed commercial power centre in the international cricket arena. Prior to the Indian government introducing its wide ranging economic reforms in the early 1990s, India’s sport broadcasting industry was nascent if not miniscule. Until the year 1984, television was still out of reach for all but very few Indians, as owning a television set in India required a license, which was required to be renewed on an annual basis.9 The license fees paid by those who could afford to own a television, was used to fund the operations of Doordarshan, the state-owned broadcasting company. This licensing model was seemingly based on the model followed by the United Kingdom at the time with respect to the British Broadcasting Corporation (BBC) and is still in place in a substantively similar form till this day.10 Until the year 1984, which is when the licensing system was completely withdrawn in India,11 the number of television licenses issued were less than 4 million,12 despite India’s population at that time being above 750 million.13 Since then, Doordarshan has been funded primarily by advertising revenues and the Government of India. While the withdrawal of the licensing system could well have provided more Indians with the opportunity to purchase televisions, it did not, at least in the beginning, increase the number of broadcasters that were providing their services in India. Doordarshan seemingly enjoyed a monopoly14 with respect to sports broadcasting until the early 1990s, as it was the only Indian broadcasting company which had the necessary resources, infrastructure and capability to broadcast live sports. Doordarshan used this dominant position to dictate terms to sports event organisers and often did not pay them for rights to cover their events. In fact, in some cases, Doordarshan reportedly charged sports authorities such as the Board of Control for Cricket in India (“BCCI”) in order to broadcast events organised by it.15 Reports claim that Doordarshan used to charge the BCCI a fee of Rs. 5 lakhs for each live telecast of a BCCI event, in order to meet its production costs.16 As there was no realistic competitor who had the capability or bandwidth to broadcast cricket matches at the time, the BCCI had no choice but to go along with this arrangement. However, this situation was turned on its head in 1992-93 pursuant to the economic reforms that had been undertaken by the Indian government and the influx of foreign investment in the Indian economy. The BCCI, which was seemingly emboldened by these developments, sensed an opportunity to break free of Doordarshan’s shackles over cricket broadcasting17 and sold the global television rights for England’s 1992-93 tour of India to Trans World International (TWI).18 TWI thereafter sold the rights to telecast the matches in India to Doordarshan for a reported fee of USD 1 million,19 of which approximately USD 600,000 was reportedly paid to the BCCI,20 marking the transaction as the first significant revenues received by the BCCI under a broadcasting deal for its events. Pursuant to this deal, Indian cricket felt emboldened to deal with private entities and sell the broadcast rights for their events to the highest bidder. A couple of years later, the Cricket Association of Bengal (CAB), which was the organiser of the 1995 Hero Cup One Day International (ODI) tournament, sold the broadcast rights to the event to TWI, who then agreed a deal to provide exclusive live coverage of the event to the then newly launched satellite broadcaster STAR TV.21 This development proved controversial with Doordarshan initiating legal proceedings against the CAB. In the meantime, the BCCI had also entered into a USD 3 million deal with TWI and provided them with the exclusive rights to broadcast Indian cricket (played in India) for a period of 5 years.22 This deal was also challenged by Doordarshan in court and was made a part of the legal proceedings in the CAB case. The CAB case was decided in favour of the CAB and the BCCI, with the court ruling that airwaves were public property, thus opening the floodgates for additional private broadcasters to enter into India. By the late 1990s and early 2000s, specialized sports networks started entering the country and they introduced coverage of a range of sports which were previously largely inaccessible to the Indian sports fan. 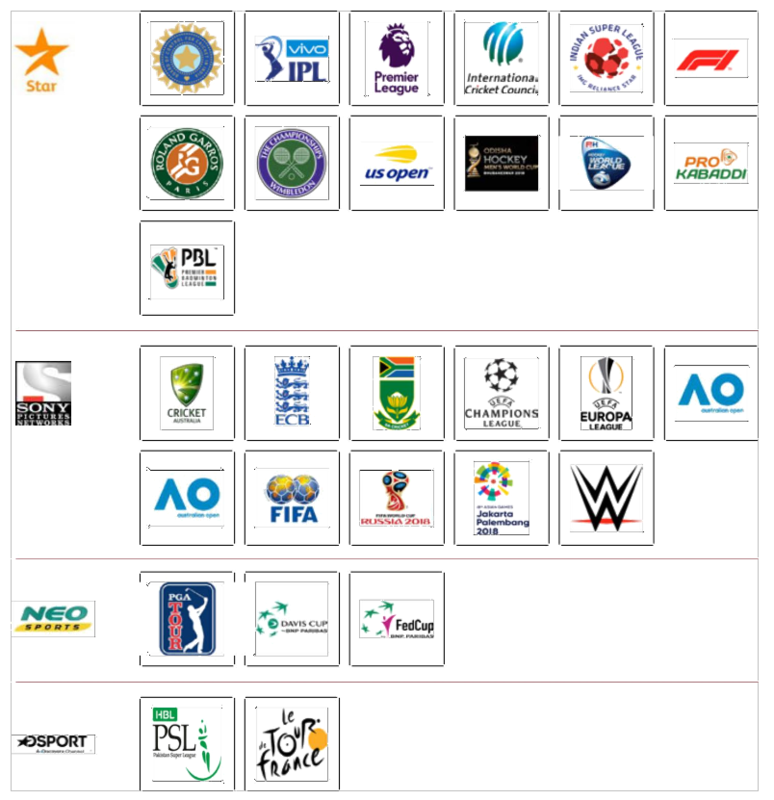 Such coverage helped slowly build a significant fan base for several international sports properties such as the English Premier League, Formula 1 and professional wrestling which helped sports broadcasters to not be completely dependent on cricket. The sports broadcasting market was further boosted by the entry of several multinational corporations into India following the aforementioned economic reforms of the early 1990s. These corporations manufactured a range of consumer products which required advertising to draw the attention of the consumer. Cricket, with its wide following and a structure that allowed multiple breaks in play, presented a perfect opportunity for advertisers to capitalise on. Sports broadcasters also saw an opportunity to commercialise other live sports events, all of which provide attentive eyeballs for sustained periods of time. The potential to earn substantial amounts of advertising revenue through cricket and other live sports encouraged and continue to encourage broadcasters to contest for sports rights. The various elements of a healthy sports broadcasting ecosystem were gradually falling into place. In recent times, the sale of broadcasting and media rights have emerged as a key revenue stream in the business of sport and in ensuring the financial viability of a major sporting event. In fact, broadcasting and media rights account for a major chunk of a sport federation’s revenue. On the other hand, the live nature of sport benefits broadcasters and gives them quick access to a mass audience, which enables them to rake in Television Rating Points (TRPs) and attract advertising revenue. As discussed briefly in Section II above, Doordarshan, which was the sole sports broadcaster in the country until the early 1990s, primarily functioned as a service provider with respect to the broadcasting of sports events. It was not oriented to expend money to acquire media/broadcast rights but instead charged sports authorities services fees to produce and carry live feeds of their events on its network. Presumably, it was not viable or economically feasible to expect a purchase of broadcast rights, considering the state of the economy at the time and minimal penetration of television. This meant the BCCI had little leverage and spent production and carriage fees hoping to recover amounts from on-ground sponsorship and the staging/hosting fees available for some events. Doordarshan could not realistically monetise live broadcasts through subscriptions as it was a state owned terrestrial broadcaster. The situation now however, couldn’t be more different. Sports broadcasters constantly compete with each other and engage in bidding wars or auctions in order to secure broadcast rights for particular events. Broadcasters have the opportunity to recover the amounts paid to secure such rights through not only advertising revenues, but also through revenues earned through subscription-based distribution across platforms. Securing media and broadcast rights helps drive up subscriptions among viewers who would otherwise not be able to access such content, thus boosting viewership and consequently advertising revenue. In certain cases, sports broadcasters may use the revenues received from marquee properties which attract huge viewership and advertising interest to subsidise the cost of broadcasting events that may have lesser viewership or interest. It should be noted that sports broadcasters have to account for some element of uncertainty, even while bidding for marquee events such as global cricket tournaments. If a particular event does not continuously engage its main target audience over the entire duration of the tournament, it fails to remain an attractive viewing proposition for advertisers and could thus hurt the sports broadcaster’s bottom line. A notable example of this phenomenon occurred during the ICC 2007 Cricket World Cup, which was held in the West Indies. Due to the time difference between India and West Indies, most matches in the tournament were scheduled to be played after midnight or in the early hours of the morning, India time, which has the biggest cricket watching audience in the world by far. The non- viewer friendly timings already contributed to the sports broadcaster, Sony Entertainment Television (“SET”) in this case, receiving low advertiser interest and when India (along with Pakistan) was knocked out of the tournament in the group stages after playing only 3 matches, interest in the tournament (which went on for more than one and a half months) completely waned and advertisers withdrew their campaigns, setting up potential losses for SET23. In order to prevent such instances in the future and in order to safeguard their investments, broadcasters are now also playing a greater role in the scheduling, format and governance of cricket events for which they own media rights. This has resulted in organisers structuring their tournaments in a manner that ensures that high profile teams play a significant amount of matches in order to keep viewership levels steady. For example, the format of the ICC 2019 Cricket World Cup has been modified into a 10 team round robin format whereby the 10 qualifying teams play each other at least once24, which removes the possibility of high profile teams such as India, Pakistan and Australia exiting the tournament relatively early and thus materially affecting the financial viability of the tournament. In order to ensure that ICC events attract as many television eyeballs as possible, the ICC has also instituted a mechanism for its most recent rights cycle (2016-2023) whereby the privilege of hosting major ICC events during this period is restricted to the three biggest cricket playing countries (India, England and Australia).25 Crucially, the television broadcast timings for cricket played in these three countries are generally favourable for an Indian audience. increase in interest in sports such as football, kabaddi, badminton, basketball etc. This is partly due to the introduction of various Indian professional sports leagues such as the PKL and the ISL, as well as a concerted effort by international sports leagues such as the NBA to increase their engagement with fans in India. It must be said however that the broadcast rights for Indian cricket, ICC events and the IPL remain the crown jewels and are the most sought after in the current landscape. This is evidenced by the fact that the media rights for five seasons of the IPL were secured by STAR India for Rs. 16,437.5 crores (which represent a whopping 255% increase on the value of the consolidated media rights for the 2017 IPL season) and the media rights for all BCCI organised cricket events for a period of 5 years were secured by STAR India for a staggering Rs. 6,138.1 crores (which represents an approximately 40% increase on the per match valuation as compared with the previous rights cycle). These sums naturally dwarf any broadcasting deals relating to any other sport in India but are still short of some of the most expensive broadcast rights deals elsewhere in the world. Over the last few years a couple of major sports broadcasters have been forced to either tone down their operations (such as Nimbus) or to put themselves up for sale (such as Ten Sports)27. Sony Pictures Networks’ (SPN) recent acquisition of the Ten Sports network28 has resulted in SPN and STAR India, operating more than a dozen separate sports channels between them. It will be interesting to see how Indian competition regulators will respond to the evolving nature and practices of the Indian sports broadcasting market. Outside the Indian market, a situation had arisen in the international arena with respect to the sale of broadcast rights for England’s Premier League whereby the European Commission (EC) in 2006,39 assessed the collective rights agreement of the Premier League’s clubs and held that the collective selling of broadcast rights inter alia, (i) reduces the choice of media operators by limiting packages available to them; (ii) reduces the choice available to consumers by reducing the amount of different media operators who can broadcast Premier League matches; (iii) leads to higher prices as a reduced amount of media operators or only one media operator means there is no competition in relation to the price in the market; and (iv) if it leads to one broadcaster holding all the rights, then technological innovation will be reduced to the detriment of consumers. The EC further ruled that the above are the key ingredients of an anti-competitive market. In order to reinstate a competitive market, the EC directed the Premier League to: (i) establish a no single buyer rule with respect to all of its packages of rights; (ii) create more evenly balanced packages of rights; and (iii) increase the availability of rights to broadcasters via mobile phones. The Indian sports broadcasting industry has its own unique regulatory regime that aims to ensure that sports fans are not necessarily compelled to subscribe to a particular broadcaster in order to watch certain marquee events which are deemed to be of national importance. The Sports Broadcasting Signals (Mandatory Sharing with Prasar Bharti) Act, 2007 (“SBS Act”), requires broadcasters to share live broadcasting signals of sporting events of ‘national importance’ with Prasar Bharti to enable the public broadcaster to re-transmit them. Notably, the criteria to determine what constitutes “sporting events of national importance” have not been specified under the SBS Act or the rules enacted in relation thereto. The list of sporting events of national importance is determined and notified by the Ministry of Information & Broadcasting (“MIB”) in consultation with the Ministry of Youth Affairs and Sports and Prasar Bharati and is completely up to their discretion. This lack of clarity on which events constitute events of national importance has made the sports broadcasting market unstable as it in effect gives the MIB the right to notify any sports event being broadcast in India as one of national importance, although broadcasters have the opportunity to challenge the determination. It is pertinent to note that the list of events of national importance currently includes several prominent international sporting events which hold significant commercial value to sports broadcasters in the Indian market. While the regime established under the SBS Act enables free to air, and thus wider public access, to such sporting events deemed to be considered of national importance, it has also created a scenario where Prasar Bharati has the right to telecast such events on Doordarshan without having to engage in bidding for rights and paying any fees to the relevant rights-holders. 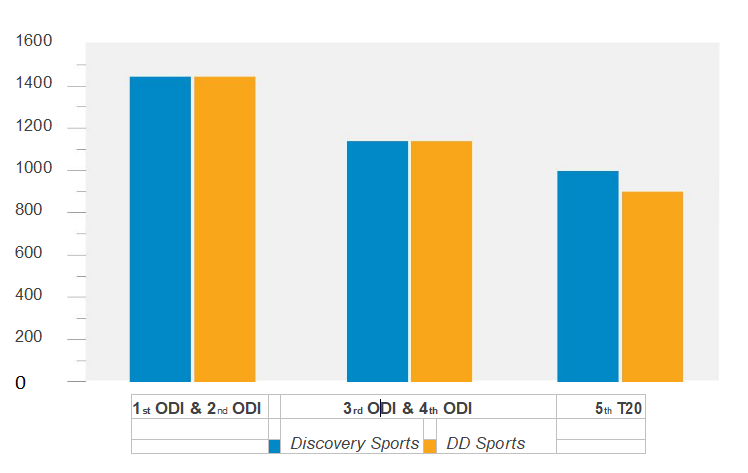 Figure 3 - Doordarshan viewership compared with first ranked channel Star Sports 1 (Hindi) viewership of India-Australia ODI series (September 2017 - October 2017) on the basis of the BARC Weekly Data Reports (Number of impressions in millions). 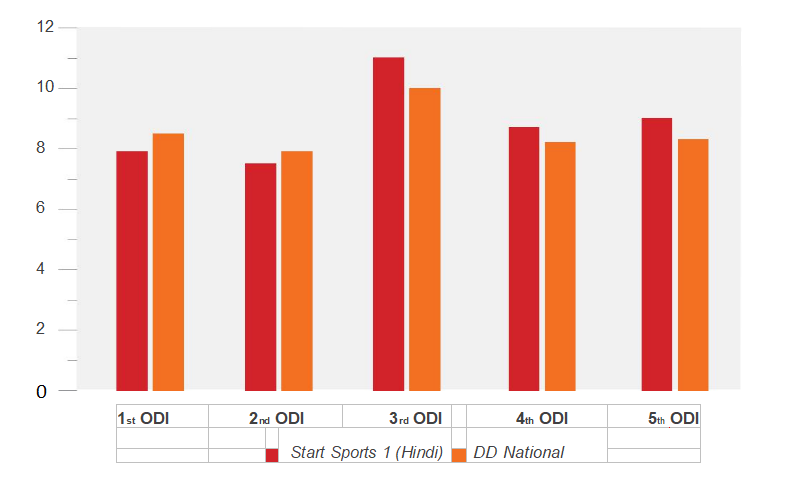 Figure 4 - Doordarshan viewership compared with the first ranked channel’s viewership of India, Sri Lanka Bangladesh multilateral T20 series on the basis of the BARC Weekly Data Reports in GVL (Gross Viewership in lakhs). As indicated in the table, Doordarshan was the first ranked channel and its viewership was higher than the official broadcaster, Discovery Sports, till the fifth T20. Prior to the advent of the television age, the radio was the primary instrument and radio broadcast, the primary medium, for following and keeping updated with sports events remotely. While hard to fathom for today’s young city-dweller in this digital age, passionate sports fans of a certain vintage may recall tuning in to the radio at odd hours and listening to commentary from a match featuring their favourite stars in some remote corner of the world. Given the late stage at which television access and penetration became widespread in India, especially in rural areas, as well as other factors such as affordability and the lack of regular power supply, the radio was the main instrument which facilitated live sports coverage for Indian sports fans for decades. The existing regulatory position in India permits only the public terrestrial radio broadcaster, All India Radio (“AIR”), to undertake live commentary of international and national-level sporting events. Historically, AIR’s coverage of notable sports events, particularly cricket, enjoyed significant reach and popularity. There is a reasonable case for stating in the context of Indian cricket that radio broadcast of cricket matches established widespread passion for cricket amongst the Indian public. However, increased television penetration and availability of live sports broadcasts on television, in the years following the liberalisation of the Indian economy, gradually reduced the radio’s role as the primary medium for tracking one’s favourite sports events. Even as the television sports broadcasting industry expanded rapidly in India, as mentioned above, radio coverage of sporting events and their popularity stagnated. This can be explained by the prohibition on private radio stations from transmitting live commentary of sports events on their terrestrial radio channels, which provides AIR with a monopoly in this area. With the lack of competition, AIR has been sluggish to evolve with changing consumption patterns and public expectations and has often failed to aggressively engage in acquiring audio broadcast rights from sports event rights holders. Sports event rights holders have also balked at the sometimes-paltry fees offered by AIR, when compared with the significant sums offered by private players for acquiring television rights. The evolution of internet and mobile technology has also rendered the existing regulations and restrictions on live radio commentary of sports events moot. There is no restriction under Indian law, per se, on a website or a mobile application offering off-tube live sports commentary or other audio coverage of a sporting event. Consumers may well choose to listen to live audio coverage of an event through their preferred internet radio service or mobile application, while simultaneously viewing video coverage of the event on another platform. Given this scenario along with advancing technology and changing content consumption habits, it will be interesting to observe whether standalone audio broadcasting rights will ever be heavily pursued by Indian broadcasters. The proliferation of internet and mobile access among the Indian population is set to change the very nature of broadcasting and the manner of consumption of sports content by the Indian public. The growing involvement of internet and digital platform operators (who may not generally be considered as broadcasters) in the buying and distribution of premium sports rights is part of a wider change in the ‘media sport content economy’, whereby the growth of new media technology, chiefly the internet, mobile devices and social media, represent a shift from the long-established ‘broadcast model’ characterised by scarcity, with high barriers of access and costs restricting the number of media companies and sports organisations able to create, control and distribute popular sports content, to a ‘networked model’ defined by ‘digital plenitude’45 with new technology significantly lowering entry barriers to commercialise sports content. Further, the rise of the smartphone as the device through which most of our daily activities are managed has resulted in us having a medium through which to consume content at all times, no matter our whereabouts. We now have (at least) one generation of consumers that has grown up with mobile devices with high-speed internet connections at hand, a phenomenon that has inevitably and irreversibly moved their consumption habits away from linear programming and towards on-demand content. At the same time, however, the availability of premium sports rights remains tightly controlled by the sports organisations themselves who will be keen to preserve a major source of revenue. Consequently, in an increasingly converged media environment, premium sports rights remain as important, if not more important, than ever. With television penetration and internet access continuing to increase across the country, the present focus for both Indian sports organisations/ federations and broadcasters, is to extend the reach of their events to the widest possible audience in India, including such demographic groups as well as regions which may have been previously ignored. In this respect, it is worth noting the attempt by certain Indian sports broadcasters to diversify the availability of live sports feeds with commentary and coverage in vernacular languages of the south and the east, so as to expand viewership in these geographies. Further, licensing arrangements between broadcasters and mobile telecom and over-the-top service providers, may potentially permit wider dissemination of live and on demand sports content through the mobile and digital services of such service providers, and thereby extend audience reach and engagement, given that the smartphone is slowly becoming the primary and preferred ‘screen’ for consumers. Sports governing bodies, leagues and event organisers are also placed in a position where they must determine a balance between protecting the exclusive interests of broadcast rights holders, against the interests of dissemination and wider public access of sports events and content. The substantial investments emanating from broadcasters to acquire broadcast rights, currently underpin the sustainability and profitability of most sports leagues, events and competitions. However, as observed in certain developed countries where multiple sports attempt to capture public attention almost simultaneously, the continued absence of a sport’s events/competitions on free-to-air channels or the state public broadcaster’s channels, reduces existing fan engagement as well as the ability of such sport to garner fresh fans and attract new audiences beyond existing fan circles. While this may not currently be an issue in India, particularly with cricket as an undisputed leader, and the current mandatory sharing regime, it is a factor worth considering in light of rapidly changing technology and consumption habits among consumers and fans, as well as the increasing demand for and availability of a more diverse number of sporting and entertainment activities. The sports fan is after all the ultimate stakeholder, with broadcasters acting as the intermediaries between the fan and the sport. Sports broadcasting and the manner of evolution of the broadcaster’s role has fundamentally revolutionised both the commerce and operational structure of sport, in India and across the world. In continuing to evolve, the sports broadcasting industry will always be called upon to orient its vision and practices to place the sports fan and the viewer at the very centre of what it does. Sports law and regulation must be designed to incentivise and promote the prioritisation of public interest through a balanced melange of regulations that are both free market as well as visionary. This article has been taken from the report entitled “A Wider Spectrum – Balancing the Many Interest in Sports Broadcasting Regulation in India” by the Sports Law and Policy Centre, Bengaluru. The original report is available to view here. 1 Gaurav Laghate, ‘TV viewers in India now much more than all of Europe’s’, (The Economic Times, 3 March 2017) https://economictimes.indiatimes.com/industry/media/entertainment/media/tv-viewers-in- india-now-much-more-than-all-of-europes/articleshow/57438521.cms accessed 30 July 2018. 3 ‘Internet users in India to cross 500-million mark by June 2018: IAMAI report’, ( The Indian Express, 21 February 2018) https://indianexpress.com/article/technology/ tech-news-technology/internet-users-in-india-to-cross-500-million-mark-by-june-2018-iamai-report-5071941/ accessed 30 July 2018. 4 Rajendar Sharma, ‘Cricket Undisputed Leader In Indian TV Viewership In 2017’ (InsideSport, 8 January 2018) https://www.insidesport.co/cricket-undisputed-leader-indian-tv-viewership-2017-508012018/ accessed 30 July 2018. 6 Vikas SN, ‘Hotstar sets new streaming record with over 10 million concurrent viewers’, (The Economic Times, 28 May 2018) https://tech.economictimes.indiatimes.com/news/internet/hotstar-sets-new-streaming-record-with-over-10-million-concurrent-viewers/64355939 accessed 30 July 2018. 7 ‘Reliance, Star India, IMG Set to Launch ISL’ (Indian Super League, 20 October 2013) https://www.indiansuperleague.com/press-releases/reliance-star-india-img-set-to-launch-isl accessed 30 July 2018. 8 Gaurav Laghate, ‘Star to Double Investments in Kabaddi League, add 4 teams’, (The Economic Times, Mumbai, 29 March 2017) https://economictimes.indiatimes.com/ industry/services/advertising/star-to-double-investments-in-kabaddi-league-add-4-teams/articleshow/57886633.cms accessed 30 July 2018. 9 K. Unhikrishnan, ‘Doordarshan: India’s National Broadcaster’ (2010) 18 Online Journal of Space Communication https://spacejournal.ohio.edu/issue18/ kunhikrishnan.html accessed 30 July 2018. 10 ‘What does your licence fee pay for?’ (TV Licensing) https://www.tvlicensing.co.uk/check-if-you-need-one/topics/what-does-your-licence-fee-pay-for-top13 accessed 30 July 2018. 11 K. Unhikrishnan, ‘Doordarshan: India’s National Broadcaster (2010) 18 Online Journal of Space Communication’ https://spacejournal.ohio.edu/issue18/ kunhikrishnan.html accessed 30 July 2018. 13Shamik Bag, ‘1984: India’s space odyssey’ (Livemint, 15 April 2017) accessed 30 July 2018. 14Boria Majumdar, ‘How a cash-strapped BCCI in the early 90s became the world’s wealthiest board’, (The Economic Times, 4 September 2017) https://blogs. economictimes.indiatimes.com/et-commentary/how-a-cash-strapped-bcci-in-the-early-90s-became-the-worlds-wealthiest-board/ accessed 30 July 2018. 17Paul Smith, ‘Television Sports Rights Beyond the West: The Cases of India and South Africa’ (2016) Global Media and Communication 12 (1) 67. 20Boria Majumdar, ‘How a cash-strapped BCCI in the early 90s became the world’s wealthiest board’, The (Economic Times, 4 September 2017) https://blogs. economictimes.indiatimes.com/et-commentary/how-a-cash-strapped-bcci-in-the-early-90s-became-the-worlds-wealthiest-board/ accessed 30 July 2018. 21Paul Smith, ‘Television Sports Rights Beyond the West: The Cases of India and South Africa’ (2016) Global Media and Communication 12 (1) 67. 23‘Early India exit costs sponsors’ (News24, 29 March 2007) https://www.news24.com/xArchive/Sport/CWC2007/Early-India-exit-costs-sponsors-20070329 accessed 30 July 2018. 24‘How the World Cup became a 10-team affair’ (ESPNcricinfo, 12 June 2018) https://www.espncricinfo.com/story/_/id/23768414/how-world-cup-became-10-team-affair accessed 30 July 2018. 25‘ICC revenue model favours wealthy cricket nations, says CWI’ (ESPNcricinfo, 27 June 2018) https://www.espn.in/cricket/story/_/id/23922798/icc-revenue-model-favours-wealthy-cricket-nations-says-cwi accessed 30 July 2018. 26‘Sports in India’ (Ernst & Young, July 2017) https://www.ey.com/Publication/ vwLUAssets/ey-sports-newsreel/$File/ey-sports-newsreel.pdf accessed 30 July 2018. 27‘Zee Entertainment Looking To Sell Ten Sports’ (NDTV, 29 August 2016) https:// www.ndtv.com/business/zee-entertainment-looking-to-sell-ten-sports-1451758 accessed 30 July 2018. 28‘Zee Entertainment Completes Sale Of Ten Sports To Sony’ (Bloomberg Quint, 18 September 2017) https://www.bloombergquint.com/business/2017/09/18/zee-entertainment-completes-sale-of-ten-sports-to-sony accessed 30 July 2018. 29Raushni Bhagia, ‘Not just cricket: Are broadcasters serious about investing in other sports?’ (Best Media Info, 5 October 2017) https://bestmediainfo.com/2017/10/not-just-cricket-are-broadcasters-serious-about-investing-in-other-sports/ accessed 30 July 2018. 32Times Group-led consortium wins IPL internet, mobile rights’, (The Hindu, 20 March 2011) https://www.thehindubusinessline.com/news/variety/Times-Group-led-consortium-wins-IPL-internet-mobile-rights/article20111131.ece accessed 30 July 2018. 33Arzoo Dina, ‘Star unit wins Internet, mobile rights for IPL’, (LiveMint, 11 February 2015) https://www.livemint.com/Consumer/7k4StgIy78lBYCdzFYMyeJ/Star-unit-wins-Web-mobile-rights-for-IPL.html accessed 30 July 2018. 34Nandan Kamath, Roshan Gopalakrishna, ‘Decoding the Indian Premier League Media Rights Sale – Part 1’ (Law In Sport, 1 December 2017) https://www.lawinsport.com/ topics/articles/item/decoding-the-indian-premier-league-media-rights-sale-part-1 accessed 30 July 2018. 35Alex Heath, ‘Facebook bid $610 million for the rights to stream Indian cricket matches’ (Business Insider India, 5 September,2017) https://www.businessinsider. in/Facebook-bid-610-million-for-the-rights-to-stream-Indian-cricket-matches/ articleshow/60380207.cms accessed 30 July 2018. 36Harveen Ahluwalia, ‘Dish TV warns Competition Commission on Star India’s monopoly of cricket’, (Mint, 23 August 2017) https://www.livemint.com/Consumer/Uu5jTpVkaBnjANU0k4rSIJ/Dish-TV-warns-Competition-Commission-on-Star-Indias-monopol.html?utm_source=scroll&utm_medium=referral&utm_ campaign=scroll accessed 30 July 2018. 37Surinder Singh Barmi v The Board of Control for Cricket in India, Case No. 61/2010, Competition Commission of India. 39‘Selling television rights for the FA Premier League and European Competition Law’ (In Brief) https://www.inbrief.co.uk/football-law/selling-premiership-television-rights-european-law/ accessed 30 July 2018. 40‘Premier League TV rights: Five of seven live packages sold for £4.464bn’ (BBC, 13 February 2018) https://www.bbc.com/sport/football/43002985 accessed 30 July 2018. 41‘Premier League awards UK highlights to BBC Sport’ (Premier League, 30 January 2018) https://www.premierleague.com/news/605627 accessed 30 July 2018. 42Star Sports India Private Limited v Prasar Bharati and Ors, Civil Appeal No 5252 of 2016, Supreme Court of India. 43Union of India v Board Of Control For Cricket In India and Ors, Civil Appeal No (S) 10732-10733 of 2017, Supreme Court of India. 44Jaideep Vaidya, ‘DD Sports, the sleeping giant of Indian sports broadcasting,is showing no signs of waking up’ (Scroll, 21 November 2017) https://scroll.in/field/858473/dd-sports-the-sleeping-giant-of-indian-sports-broadcasting-is-showing-no-signs-of-waking-up accessed 30 July 2018. 45Hutchins and Rowe, ‘From Broadcast Scarcity to Digital Plenitude: The Changing Dynamics of the Media Sport Content Economy’ (2009) Television and New Media 10 (4) 354.